Neighbors say high-density development would be incompatible with the surrounding area. The Mason District Land Use Committee voted Nov. 27 to not recommend approval of Woodburn Manor, a 72-unit 55+ housing development proposed for Gallows Road between Libeau Lane and the Raintree condominium. The dozens of opponents of the proposal who packed the MDLUC meeting cheered the decision. The Fairfax County Planning Commission’s public hearing on the project is scheduled for Dec. 6 but likely delay the hearing if the developer, Christopher Land LLC, decides to revise its application. The MDLUC vote is not binding, however, so the project isn’t necessarily dead. E. John Regan Jr., executive vice president and chief financial officer of Christopher Land, says he plans to consult with his team and Mason Supervisor Penny Gross before deciding on the company’s next step. A previous application by Christopher Land seeking an amendment to the county’s Comprehensive Plan for a 66-unit townhouse development on the 9-acre property was withdrawn last year in the face of opposition from the residents of the surrounding community and the county’s planning and zoning staff. The latest proposal calls for an even denser development consisting of 72 units of age-restricted housing, including 12 townhouses, 12 single-family detached houses, and a four-story multifamily building with 48 units. This time, Christopher Land is seeking a zoning special exception rather than a plan amendment. Under the county’s zoning rules, a higher-density independent living facility for people age 55 and older can be allowed on a property zoned residential if the Board of Supervisors approves a special exception. The current residential zoning designation for the property, R-2, would not be changed. The project would be too dense and would be incompatible with the surrounding community. Traffic on Gallows Road is already congested and this development would make it worse. Getting rid of nine driveways and having just one entrance to the property, on Gallows Road, would exacerbate the backups. There would be more noise and light pollution. Wildlife habitat would be diminished. Having the whole development governed by an HOA would not be effective, as the cost of maintenance would be high, particularly for a huge underground stormwater facility, and absentee owners wouldn’t care about upkeep. Older drivers are more likely to have accidents. “We remain deeply concerned. This would be a precedent-setting intrusion in a stable neighborhood,” said Edith MacArthur, president of the Holmes Run Acres Citizens Association, who has been coordinating the opposition. Local residents were particularly incensed about Christopher Land’s contention that the development won’t lead to significantly more traffic on Gallows Road. A company representative said a traffic study found there would only be an average of two more trips during the morning rush hour and six more trips in the evening. VDOT denied Christopher Land’s request for a new traffic signal on Gallows Road, but the company agreed to contribute $200,000 for a signal if one is approved in the future. In response to neighbors’ previous complaints that people younger than 55 would live in Woodburn Manor, the company agreed to tighten the rules. The residents of each unit would consist of at least one occupant who is 55+ along with that person’s spouse, roommate, or caretaker, said Christopher Land’s representative Lori Greenlief. No children under age 18 would be allowed unless mandated by court order. Guests and adult children could stay no longer than 60 calendar days a year, and short-term lodging would not be permitted. Where was this opposition to the behemoth Brightview Senior Center on Gallows? This all stems from that. Christopher Land Companies took one look and that and though that they could replicate that model. One of the objections raised during the meeting on Tuesday was the fact that, despite Christopher Land's promise that "Woodburn Manor" would be no larger than Brightview, it would be much, much larger. I'm very proud that people at the meeting--and in their letters to the powers that be--called them out on that b.s. not just once or twice, but repeatedly and firmly. I'm glad that the Land Use Committee stood with us citizens in our opposition and voted Christopher down. You are right on! I am so happy to hear from another voting, tax paying citizen who sees through the smoke-screen Christopher Land is blowing our way. Your point has been my point from the outset of the Brightview project. The then-President of the Holmes Run Acres Civic Association (HRACA) met privately with Brightview and "decided" the project was "acceptable". 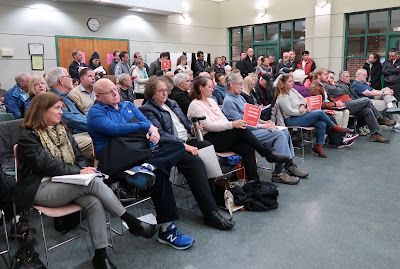 The Board of HRACA refused to take a stance on behalf of the neighborhood at any of the numerous Public Meetings held at the time by the Mason District Land Use Committee, the Planning Commission, and the Board of Supervisors. Some of these same individuals remain as representatives of the HRACA. My question was, and remains, "Where were you then?" By not working to oppose the Brightview project, we are left to deal with the outfall and example of poor development encroaching upon our door-steps. Again, both of these projects are in Mason District, where the boundary begins at the yellow center line along Gallows Road. Many of us know and disapprove of Penny Gross' pro-development voting record. Holmes Run Acres is located on the other side of the yellow line, and therefore is in Providence District. Linda Q. Smyth did nothing then, and is doing nothing now to quash these developments that will forever have a negative effect upon our neighborhood. It appears we live within the Bermuda Triangle. Im not so sure Penny Gross has an outstanding pro-development record. Look at Baileys Crss rds and Seven Corners; it is junkland USA. It was very uplifting at the meeting last night to hear and see all the residents demand a better plan from the developer and from county officials. It was great to see the Mason District Land Use Committee members really hear and understand how incongruous the development proposal was with the surrounding suburban neighborhoods. The proposal's density (4 times higher) was overwhelming in mass, and it would have been walled off by 1100 feet of retaining wall that could go as high as 13 feet. Nothing like fitting into the community. It's sad that county planners are not allowed to follow their professional concerns, but instead must just check the Special Exception regulations' boxes to say the development meets the minimum standards. Unfortunately, the Special Exception regulations are directly opposed to the area's Comprehensive Plan's guidelines. We can only hope that the Planning Commissioners and the Board of Supervisors will also be listening to their constituents and follow the Comprehensive Plan. The County needs to revisit the (lack of) logic whereby under a Special Exception the Libeau Parcel would remain classified as R-2, when the reality is that the density of the Woodburn Manor proposal is at least R-8. A complete fiction that does not inspire confidence! Precisely. It was a total load of b.s. that Christopher Land was trying to sell, but because there were so many citizens there asking questions, it became clear to everyone that they could apply for (and be granted?) enough exceptions that they could get away with calling an elephant a mouse. Absurd! I am glad that the community representatives saw through the 55+ senior housing charade. It was simply a ploy to make the increased density more palatable. "Tightening the rules", as stated by the developer.also only works if there is a reliable enforcement mechanism. Exactly! If there had been more time, I would have loved to ask exactly how they would enforce the rules they had proposed. However, I know their answer would have been more pure bunk. "No Air B&B would be permitted" my Aunt Fanny. The bottom line for Fairfax County is to continue to build real-estate residency due to the extreme and outrageous pensions and benefits that are giving to the FFC employees. 70 cents out of every dollar goes to the employee plus a social security pension while waiting for a social security pension. Real estate taxes is the easy target. Instead of being fiscal conservative, they would rather crowd the roads and increase the taxes. Penny Gross needs to go. She is benefiting from her very generous retirement system from FFC. Mason District is a disaster with its trash, its poor school system and the lack of services due to the extreme benefits and generous retirement. We are a pawn in the swamp of those working for the county. So happy this was a beginning of taking control of the FFC but then again, the Demns will continue to do this and raise you taxes. You got what you voted for. Everyone else commented on the actual issue at hand instead of going into a rant about a political party - did this comment really add anything to the discussion of the issue? No - just more anger - and yes, the country got what it voted for! I wish I had gone to the meeting to support the developer. I can't understand why people think it is any of their business what someone else does with their property. Changes happen. That's how communities work. Get over it. Then what is the purpose of a Comprehensive Plan? This is the guiding document that communities rely on to allow the changes you refer to. In this case these parcels are currently zoned R-2. This developer wants to stuff hundreds more people into this small area that is already a bottleneck traffic wise. People have not just the right but the obligation to stand up and say no, this is not what we want. It most certainly is the business of the surrounding community, democracy isn't a spectator sport. And good for these communities for standing together to say no. If they want to build denser communities put it near a metro station like what *8was done in Merrifield. Or give us a damn metro station. These Fairfax dems dont get it! We need metro and/or reliable mass transit, not busses that no one wants to take because of the time it takes to commute. Im all for development, smart development! There is climate change, is that something we should get use to? There was WWII that changed the landscape of Europe, is that something we should get use to. If a development plan is destructive, that is not something we should get use to. The change that we need to see is for these horrible BoSs to get the heck out of Dodge, collect their big fat retirment and stop wrecking what they have already managed to do so well. We need high density mixed use development at metro stations. Problem is Mason and Providence selectively chose to be stupid and not have sufficient mass transit options and Gerry Connolly went along with it back then so he could continue getting re-elected. What is needed is a new generation of leadership that has vision for the future and to inspire good investments for smart development and transit nodes. These clunkers that sit at the FFX Govt Center need to get in the their 1970 Buicks and drive to Florida where they belong. Really they have allowed the core of FFX to rot while they build metro to Dulles thus encouraging continued middle class flee to the outer suburbs of the County............shame on you for being so miopic and self serving. It is the BoS that will ultimately be FFX environmental demise if they continue to not serve its tax paying citizens. We have very few natural resources left and whether or not you admit that you benefit from them you do. We don't have to develop every inch of this county. Needs to make more affordable housing in this area! I disagree with the white upper middle class owners. Join the conversation. The Annandale Blog covers redevelopment. land use, business openings and closings, schools, crime, politics (with a progressive viewpoint), transportation, recreation, and other issues in Annandale, Seven Corners, Bailey's Crossroads, Lincolnia, and other parts of the Mason District area of Fairfax County, VA.
• Sign your name. If it’s your opinion, own it. Avoid personal attacks and vulgar language. • Think about what you’re saying. Are you adding something productive to the conversation? Finally - Spring is here! April 25 - Green Festival, Northern Virginia Community College, Annandale Campus, 9 a.m.-3 p.m. This year’s theme is Biodiversity and Urbanization. Free. April 25-28 - George Mason Library Semi-Annual Book Sale. 3-9 p.m. on Thursday, 10-6 on Friday, 10-5 on Saturday, and noon-5 on Sunday. April 27 - Color Run/Walk, Annandale High School, check in at 8:30 a.m., race starts at 10 a.m.
April 27 - Culmore Multicultural Day, Woodrow Wilson Library, 10 a.m.-2 p.m.
April 30 - Stories of an Abandoned Virginia, George Mason Regional Library, 7-8:30 p.m.